Global policymaking is at risk, threatening the international liberal order which has, for all its faults and lacunae, served the world well since the second world war. There has never been a period of such rapid progress in the human condition. Most of humanity has benefited from unprecedented increases in life expectancy, reductions in violent deaths, progress on equality and rights, and improvements in the standard of living. This progress has been, in part, the happy consequence of better global policies. This prosperity is the result of the spread of market economies, open trade, investments in science and evidence, wider availability technologies, the establishment of norms and standards, the movement of people and capital to where the opportunities are greatest, and, though we have sadly not eliminated war, a significant reduction in violent interstate conflict. The policies and international cooperation that have brought all this about are not always easy. Our Commitment to Development Index, the 14th annual edition of which is published today, measures the progress of the world’s industrialised economies towards policies that contribute to make this world better for everyone. We use literally millions of pieces of data to calculate each country’s performance in seven categories: trade, environment, security, technology, finance, migration and aid. This short video explains. 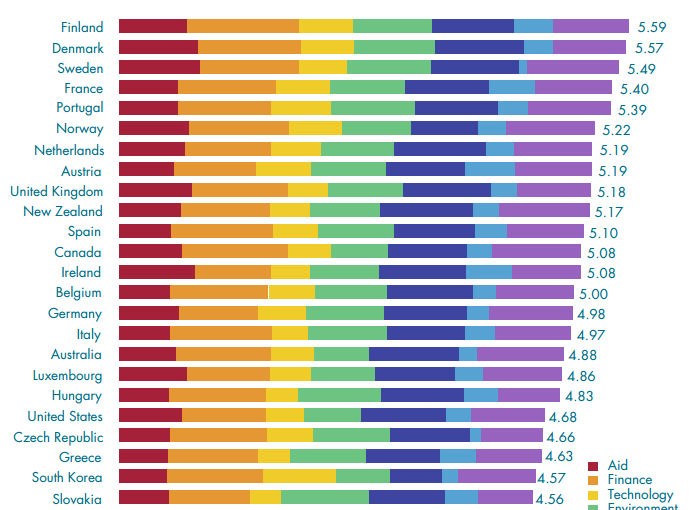 Not surprisingly, Scandinavian countries top the list again this year, with Finland, Denmark and Sweden, respectively, in the first three slots. They tend to have open and transparent financial systems and support sustainable investments in developing countries, while doing the most, relative to their size, to contribute to the global system. Such a functioning system protects the environment and improves standards of living for everyone through international security regimes and shared technology to enhance global progress. Lagging countries like Switzerland (last) and Japan (second last) demonstrate how much potential for contribution to global progress even rich countries have. While the Swiss still have room for improvement regarding financial transparency, Japan could increase its contribution to fighting climate change. But as both countries perform well in some other components, their case illustrates that the CDI is an instrument for a race to the top, inspiring the public and policy makers on how we all can do more to fight global poverty. The US is 20th out of 27 in the latest rankings, with performances above average in aid and trade but lagging especially on its environmental policies. Although they get credit for signing the Paris agreement on climate change, the US still has by far the lowest gasoline taxes and could do much more to fight global climate change. The UK ranks 9th out of 27, and also does well on aid and trade. Though they are among the leading nations for science and research, neither country does enough to help spread that knowledge to developing countries. Together with Sweden, they have the most stringent intellectual property rights in place, which restricts access to innovation for poorer countries. In the last 14 years, there has been considerable progress—the CDI shows that rich countries can do more to fight global poverty and have done so. 24 CDI countries have improved their overall score since our first edition in 2003, thereby demonstrating that more equal international policies are possible. No countries have got worse overall. The case of Austria, which shows the biggest improvement and now tops the index on security, demonstrates that even small and landlocked countries can pursue policies which have a significant impact on the well-being of millions of people in developing countries. Have we now seen the high point of this international cooperation? Obviously we hope not. There is a huge amount to do—if all countries raised their standards up to just the current average in each dimension of the CDI, that would transform the quality of life for hundreds of millions of people. What holds us back, and indeed threatens the progress the world has made, is our apparent inability to manage change. Economists will tell you that it is “win-win” to have free trade, to end agricultural subsidies, to let workers move to where they can earn more money, and to spread technologies faster. But while it might be good for every country on average, there are always individual winners and losers. In theory the losers can be compensated, but in practice we don’t seem to be able, or willing, to do that. The consequence of their resistance, and justifiable anger, is that all this progress is now under threat. We are unrepentant globalists: there is no doubt that better international cooperation has brought about, and can continue to bring about, unprecedented sustainable prosperity. The right response to the present political challenge to this agenda is to do a far, far better job of making sure that we properly manage the negative effects for people who have lost out, and work much, much harder to share the gains more widely. A rather profound and well written piece. I fervently hope we have not hit peak global cooperation.